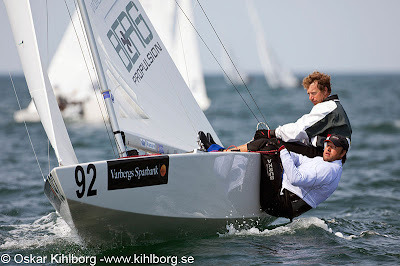 Varberg, Sweden (August 2, 2009) - Mateusz Kusznierewicz and Dominik Zycki (POL) started off the 2009 Star World Championship the same way they began the 2008 Star World Championship. They finished with a bullet after getting off to a great pin end start, rounding the first weather mark in the lead, loosely covering the fleet and maintaining a margin of nearly a minute. When Kusznierewicz was asked about the similarity between this year's start to the World Championship and last year's he said, "We'll see about tomorrow." 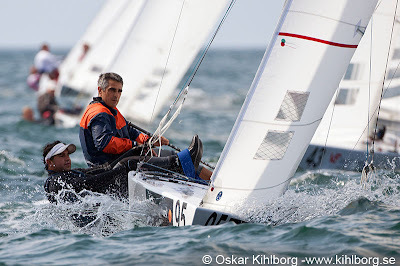 Kusznierewicz/Zycki stunned everyone in 2008 when they won the second race of the World Championship series also. Recapping the race Kusznierewicz commented, "It feels a bit surreal. We have taken such a long break that we're sticking to the basics and we see things more clearly. The race was not that simple, but it seemed simple in retrospect." The defending Star World Champions worked on their settings once they got out on the water and then focused on getting a good start. They were pretty confident with the current and the shore effect and didn't see any odd clouds that would affect the fleet radically. After punching out to an awesome pin end start, they held their lane and kept the lead. Giving them a run for their money were local favorites, Freddy Lööf and Johan Tillander (SWE). 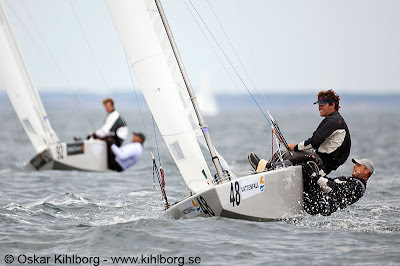 The Swedes came from double digits at the end of the first of three laps and rumbled around the right leeward gate with speed while many of the other teams fought the waves and the current. 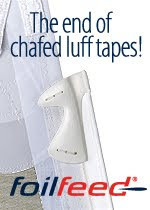 Said Lööf, "We were fast downwind and we had pretty good upwind speed." Lööf also was releived to have racing under way, stating that the team had "a good buildup to racing with the family being here through Thursday and switching into racing mode on Friday." The fight for third as the breeze fell from 12- 14 knots at the start to about 7 knots at the finish, was fierce. Flavio Marazzi and Enrico De Maria (SUI) scooped the two young German teams of Johannes Bambandererde and Timo Jacobs and Matthias Miller and Benedict Wenk on the final beat.